Michael Gordin has published over 50 book reviews in academic journals, newspapers, and magazines. Despite the hype, it takes him far longer than a day to produce each review. 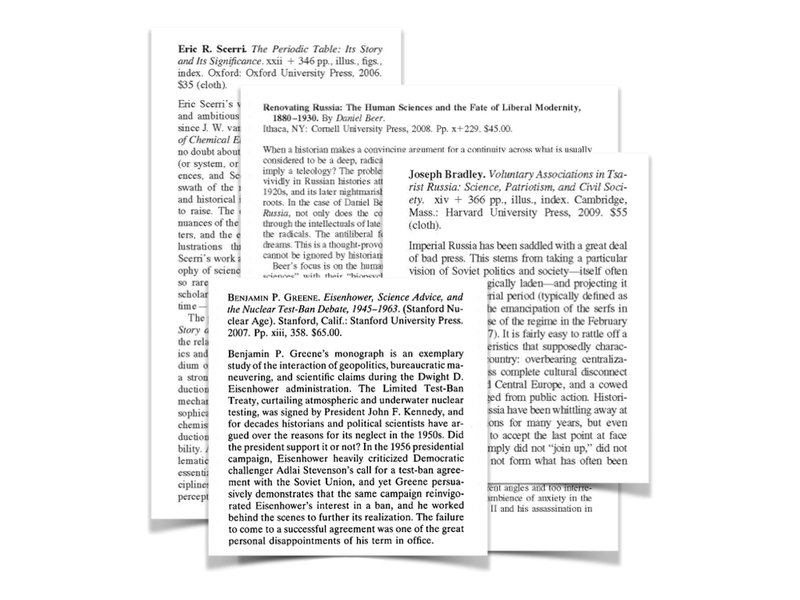 Michael Gordin, an omnivorous historian of science at Princeton University, is known for many intellectual feats, among them the “Gordin method” of book reviewing. In its mythic telling, it goes something like this. 1. Morning: read the book. 2. Afternoon: write the review. 3. Send off to the journal editor before dinner! Review of Helena Sheehan, Marxism and the Philosophy of Science: A Critical History: The First Hundred Years(London: Verso, 2017). Marx and Philosophy Review of Books(4 June 2018). "Reflexivity and the Russian Professoriate,'" Kritika 17, no. 2 (Spring 2016): 433-445. “The Tory Interpretation of History,” review of Hasok Chang, Is Water H2O? Evidence, Realism and Pluralism (Dordrecht: Springer, 2012). Historical Studies in the Natural Sciences 44, no. 4 (2014): 413-423.
Review of Plutopia: Nuclear Families, Atomic Cities, and the Great Soviet and American Plutonium Disasters (Oxford: Oxford University Press, 2013). Slavic Review 73, no. 1 (Spring 2014): 156-157. “Nuclear Mythology and Nuclear Uselessness,” review of Ward Wilson, Five Myths about Nuclear Weapons (New York: Houghton Mifflin Harcourt, 2013). Nonproliferation Review 20, no. 2 (2013): 375-380. "The Embrace of Atomic Bomb Orthodoxy and Revisionism," review of Wilson D. Miscamble, The Most Controversial Decision: Truman, the Atomic Bombs, and the Defeat of Japan (New York: Cambridge University Press, 2011). Reviews in American History 40, no. 3 (2012): 500-505. "From the Ark to Evolution," review of David R. Montgomery, The Rocks Don't Lie: A Geologist Investigates Noah's Flood (New York: W. W. Norton, 2012). Wall Street Journal (4 September 2012): A17. "The Polanyi Puzzle," review of Mary Jo Nye, Michael Polanyi and His Generation: Origins of the Social Construction of Science (Chicago: University of Chicago Press, 2011). Chemical Heritage 30, no. 2 (Summer 2012): 42-43. "Everyman's Physics," review of Margaret Wertheim, Physics on the Fringe: Smoke Rings, Circlons, and Alternative Theories of Everything (New York: Walker & Company, 2011). American Scientist (January-February 2012): 81-83. "The Sorrows of Old Werner," review of Cathryn Carson, Heisenberg in the Atomic Age: Science and the Public Sphere (Cambrige: Cambridge University Press, 2010) and David Cassidy, Beyond Uncertainty: Heisenberg, Quantum Physics, and the Bomb (New York: Bellevue Literary Press, 2009). American Scientist 98 (September-October 2010): 426-428. "Dr. Strange," review of Graham Farmelo, The Strangest Man: The Hidden Life of Paul Dirac, Mystic of the Atom (New York: Basic Books, 2009). American Scientist 97 (November-December 2009): 502-504.